My sister that lives in Oregon (waves to Oregon) always has to let me know how far along her daffodils are each year. It’s like a contest with us – which state is superior in the floral category. Although when I look at the map of the United States, it would appear that Ohio and Oregon are about equally as close to the equator, I guess spring comes much earlier there than here. And my sister has to constantly rub it in. In a normal spring, her daffs are up and in bloom before mine are even an inch out of the snow covered ground. This year, with the unseasonably mild winter, it’s only mid-February and my bulbs are out of the ground a good five inches and I can see the blooms forming already. Take that Oregon! You don’t suppose my sister’s daffs are on the fast track this year too? That would be just too annoying. 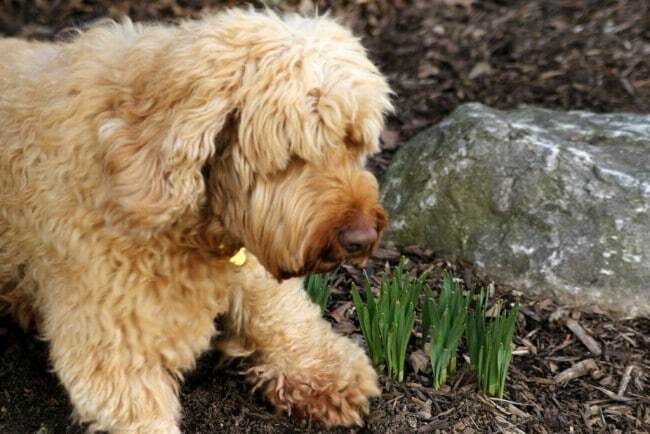 I think, if I can keep the dogs off of the daffodils, I should be able to have a fighting chance at the daffodil championships this year. 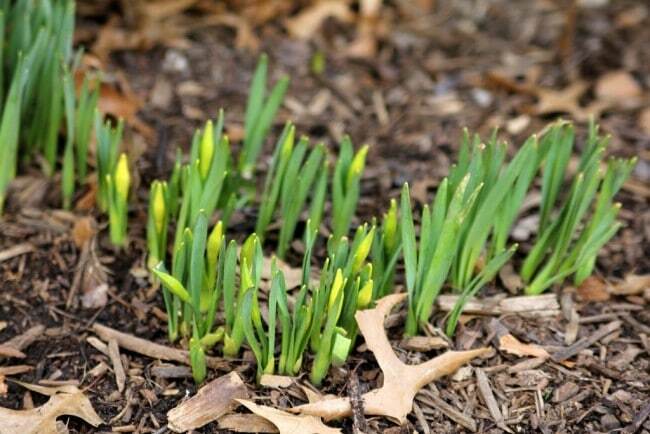 Do you have daffodils that are getting ready to bloom yet? My daffodils are up and I have some hyacinths blooming. I need to get out there and taking pics. I wish you could have met Debbie, she is a love. Here in IL mine are up but no blooms, but maybe I better get out and looks with warm weather in the 50-60’s this week! Hmmm I need to go check and see if I have any spring flowers coming up yet. I keep worrying that if they come up too early – we’ll lose them in a late season snow. As I was taking my children to school today, I noticed daffodils blooming and became giddy. I just love spring. Good luck with your daffodils!! I’m in Northern Virginia and my first daffodils bloomed on Saturday. I think this is the earliest that I can remember. Oh yes, we have ’em! Here in the south we call them ‘buttercups’!! So pretty! Signs of spring! You make me laugh. Okay–don’t delete me–I live in Oregon and would never want to live anywhere else! I love the rain, the changes in season, the coast range, the roses, the fact that everything is green. I really know nothing about Ohio though. I have to say my daffodils look just like your pictures–so your sister and you may be neck in neck in your competition this year. I am so jealous of your green thumb, Pam. I love daffodils, but I usually buy mine at the floral section at the market! I love California, so I won’t vote for Oregon or Ohio! I live in Idaho, so I am a neighbor of your sister. My daffodils are coming up, but not blooming yet. My tulips always come up later. It’s been a very mild winter here with little snow in the valley. Can’t wait for my daffs to bloom and I am so looking forward to spring! Wow, since you reminded me about BigFoot, I guess I’ll go with Ohio. Although that puppy of yours looks a little intimidating too! 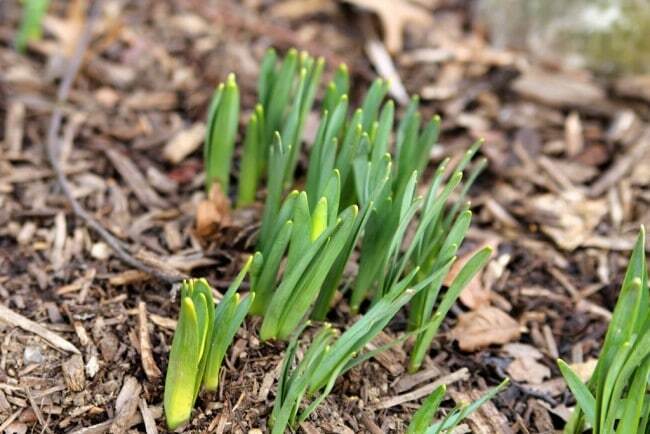 I’ll have to go poke around the yard and see if our daffs are coming up early. I’ve heard rumors that snow is coming back to West MI this weekend. The only ones I have seen recently have been at the store. So funny Pam! I know you will win this year…IF you can Miss Lacy and company from being your bigfoots. My favorite of all flowers, wish they would grow here. Yours are faring way better than mine. A mole tore up our side yard and dined on 46 daffs leaving only four to bloom. I could cry about it. Obviously no daffodils under the 5 inches of snow we just got last night! And I’m not liking all the bunny tracks that lead to my hydrangeas. Animals just don’t appreciate our gardening efforts! You’re the winner in my book, Go Ohio! I need to go check ours! Since I’m in Georgia they may have come and gone! Since my vote won’t count and I wouldn’t want to pick sides all I can say is “You crack me up”!! What a fun post! – I do have Daffodils up out of the ground with buds showing but no blooms just yet. – Oh I wouldn’t pick Ohio or Oregon, Washington (the state that is) is the place to be! They have those milder winters because of the ocean and a climate probably akin to England’s. For gardening purposes, I’d rather live in Oregon. Ohio’s climates are so drastic that things don’t grow very well for me or last and are always subject to the unpredictable weather changes. What pretty pictures. can spring be far behind? I haven’t been in my back yard, so I have no idea if any of my flowers are peeking through? I’ll have to look before the snow we’re expecting this weekend. Take care. Hope you win the war. Mine are just showing, thanks to a very warm winter, but I’m further north up here in Toronto. They’re about a full month early. Fine Ohio but how cool would it be to see Sasquatch, seriously?